"I don't know how to put this, but…"
Meadowlands Stadium: Verizon Interactive Fan Wall. I was very fortunate to have been contacted by Hill Holliday – New York to take part in this multimedia project for Verizon. Little did I know it would quickly become one of the most challenging and rewarding pieces I’ve ever worked on. The good folks at Lava Studio have put together an incredible video explaining the Verizon Interactive Wall. 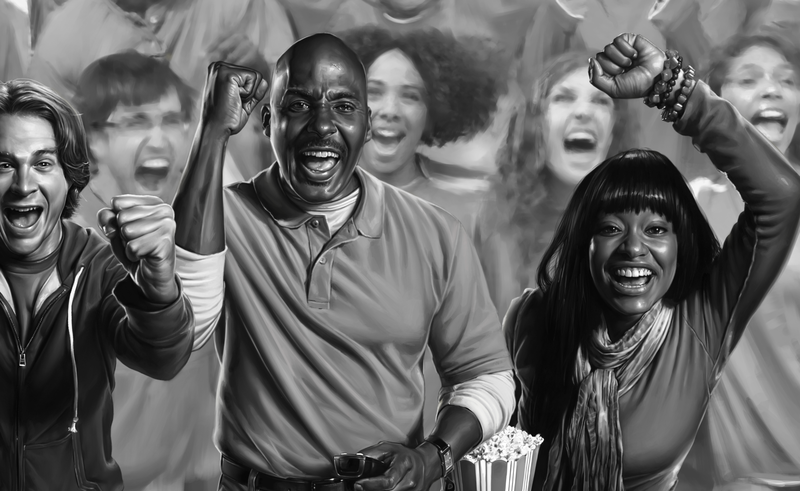 My piece of the puzzle was to create the painting of fans that would be used to cover the 30′ wall. I also painted the “life-sized” characters in the foreground. As you can see from watching the video the whole project was very “Minority Report-esque.” Three monitors scroll over the entire wall and when triggered my static black and white illustration becomes a high definition video of the person. Then a touch screen interactive graphic covers the screen allowing viewers to get stats, learn about products, etc.! Very cool concept for a sci-fi enthusiast such as myself. As I mentioned earlier, all of the assets I had to paint at actual size for reproduction on the wall. I worked in shades of gray which either a green or blue light is cast, depending upon whether there is a Jets or Giants game that day. I’ll attach some of the paintings I provided below to give you an idea of the detail needed. The creative directors wanted the style to be realistic enough to blend with the video yet remain painterly. Again, I chose to use Corel Painter to work. The agency Branger_Briz worked with Lava to develop the interactive touch based i-Wall system. 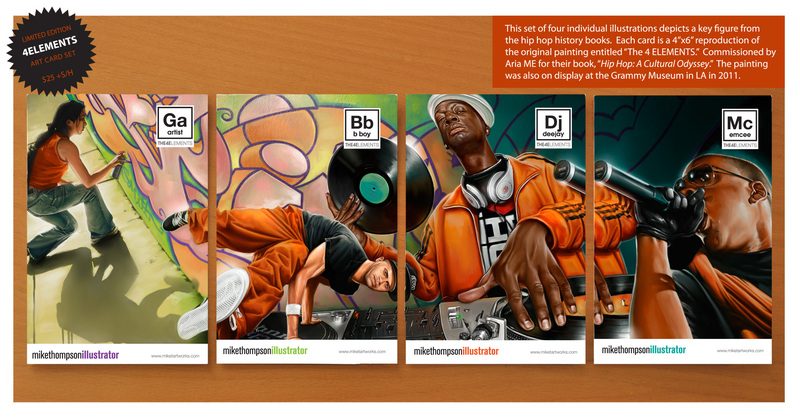 This display won two interactive awards for 2011, the Golden Addy and the Charlie Award. Again I am very happy to have been a part of it’s realization. Now I just have to get out to Jersey to see it for myself! One, I’m not a big writer. I’d rather be painting to be completely honest, but I do want a place to discuss my work. Over the past few years I’ve worked with some great clients, and have taken part in some really interesting projects. I’ll be sharing that type of news here. Wacom Webinar/Interview on March 20th. 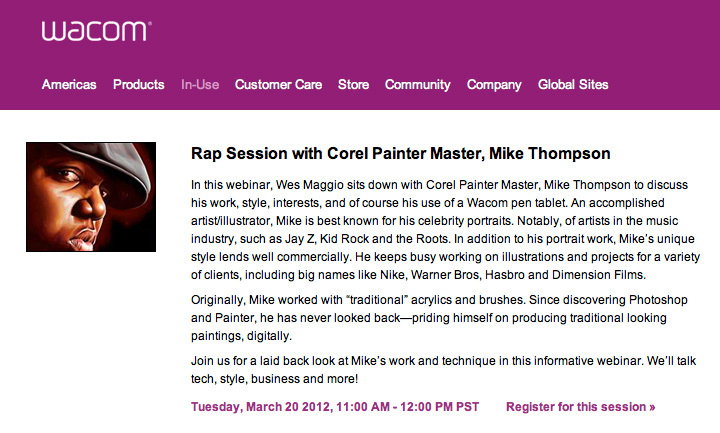 I’ll be taking part in another Webinar with one of my favorite companies of all time Wacom on March 20th. Click here to register. As always this is a free online seminar, although if you want to pay that is fine too. Hope to see you there! SUPER COLLABO TODAY 12PM EST! 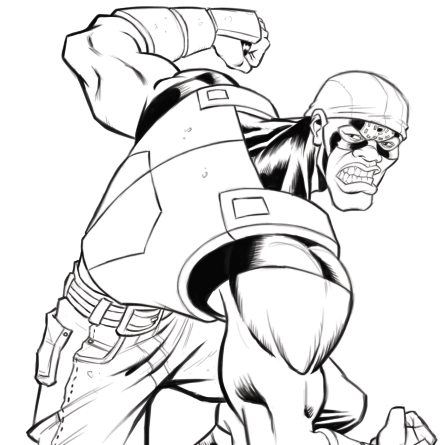 Today I’ll be painting my rendition of Big City Entertainment’s premiere Action Hero, BROTHERMAN: DICTATOR OF DISCIPLINE! It’s creator, Emmy Award winner, Dawud Anyabwile has teamed up with Brian McGee to re-envision BROTHERMAN for a new generation. Join me to see my take on this ICONIC superhero using Corel Painter 12! Corel will be posted the video on their Painter 12 Youtube channel. 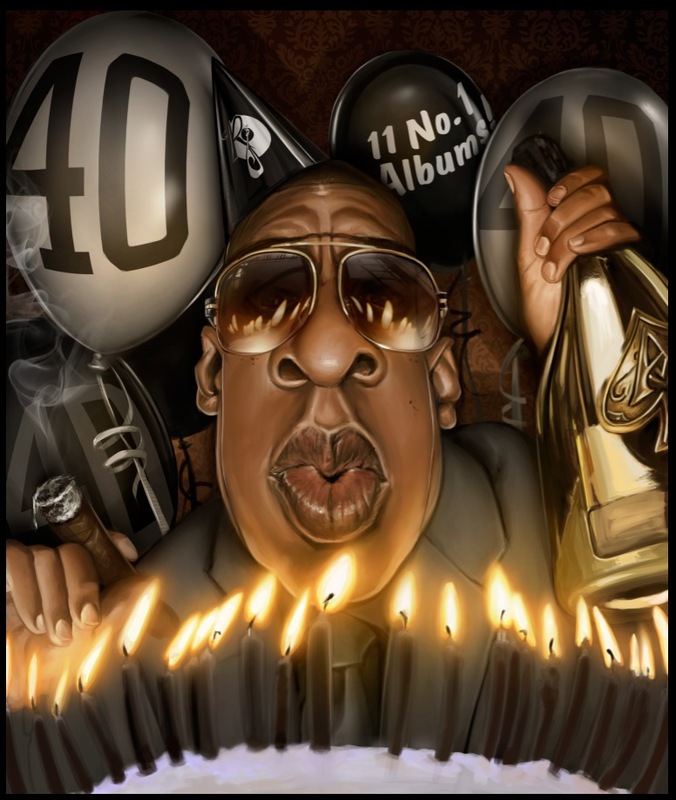 Jay Z Vibe Process Video Finale! 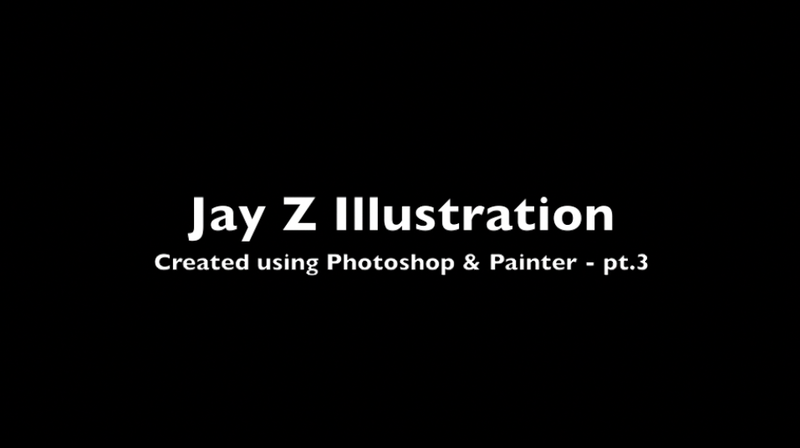 Jay Z Process Video Part Three. 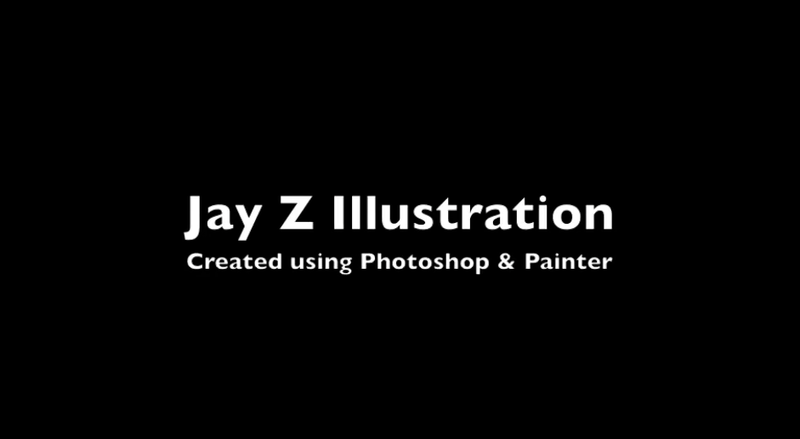 been two years in the making, but I finally got around to cutting together the final video of my making of Jay Z illo! One thing to note is how seamlessly Photoshop and Painter work. I did this illustration when I was still becoming comfortable with Painter. That being said, I spent a good bit of time rendering Jay using Adobe Photoshop CS3. I worked the background and painted over Jay using Corel Painter 11. 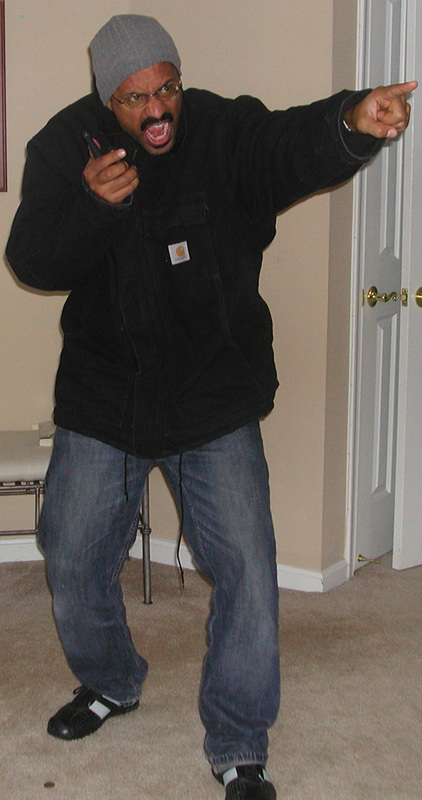 Also, I used several different picts of Jay Z and lighting shots of myself to get the mood of this one. If you look closely, you’ll catch them. Here is how the finished painting appeared in the magazine. Note: The soundtrack is pretty tame, but you might want to turn it down if there are kids watching, a few words got by me. Now I need to get ready for my Painter 12 tutorial tomorrow! Hope you can join me, I have something special planned! if you like this piece, Please comment and Share! I haven’t really done a lot of personal sales of my art. However I have been getting a whole lot of requests for this piece. I want to gauge interest, by starting with these sets of cards. I have made a limited number and am now offering them for sale. If you are interested in purchasing please contact me. 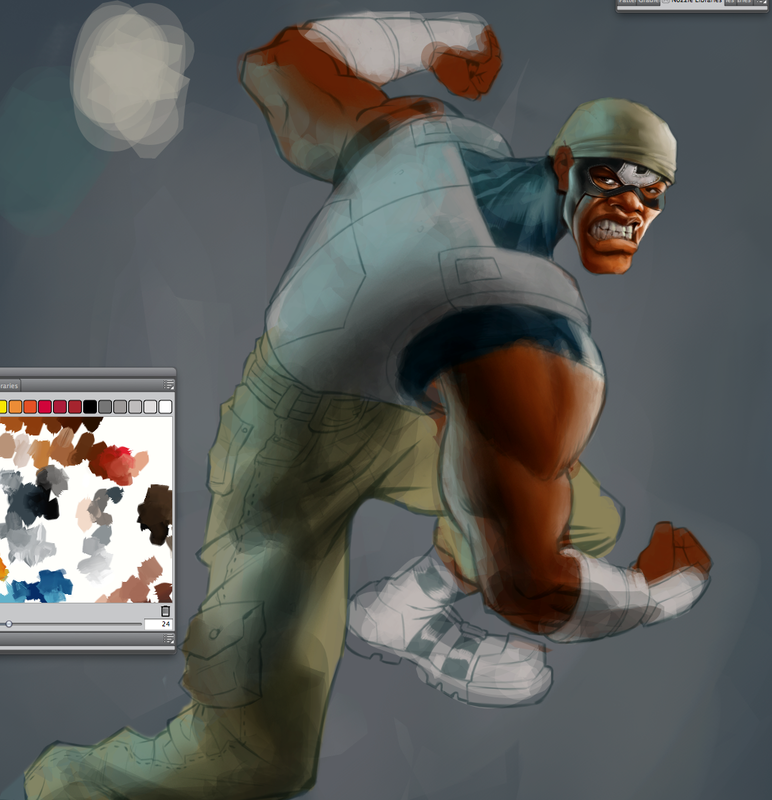 Click here to Join me for my next Free Corel Painter 12 Webinar! 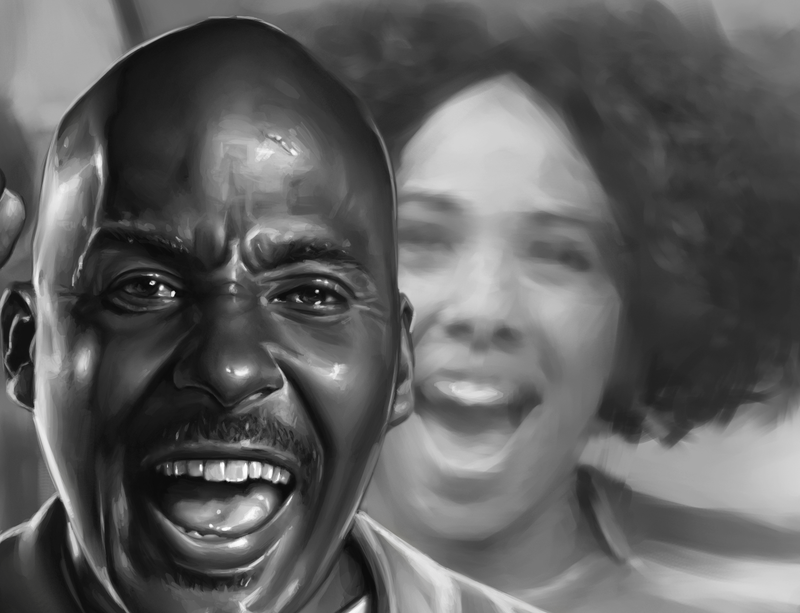 January 17th 12PM EST I’ll be teaching my third live webinar for Corel Painter. I have something special in mind for the subject, hope you can join me! I’ll be answering questions over cookies and milk @ the end. (Registration is Free but you have to bring own cookies.) Please share and I hope to see you then! I’ve been meaning to post high res versions of these process videos for a while. Here are a couple of videos of my paint process. I’m currently working with a company to produce more of these types of tutorials. If you like please Share and Comment. Warning, a few of the Public Enemy tracks aren’t exactly “office/kid friendly.” You might want to listen with headphones or mute. Or, if your office likes good hip hop turn it up! Jay Z Process Video part One. Jay Z Process Part two. 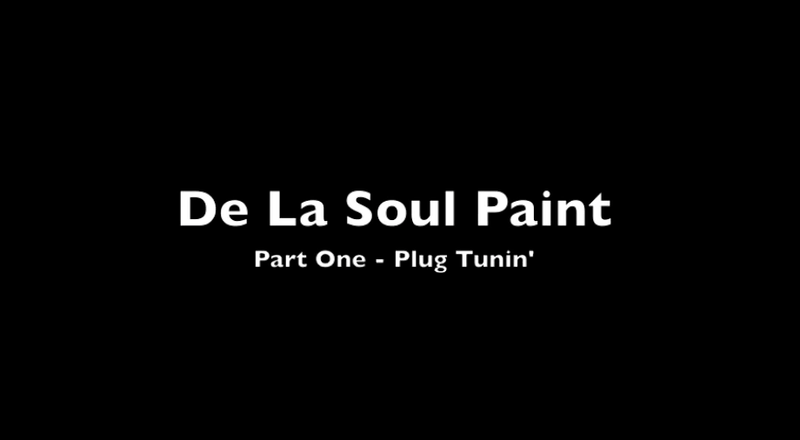 De La Soul Paint Process part One. I am pleased to announce that one of my very recent pieces has been accepted to the Macworld / iWorld Digital Art Gallery. 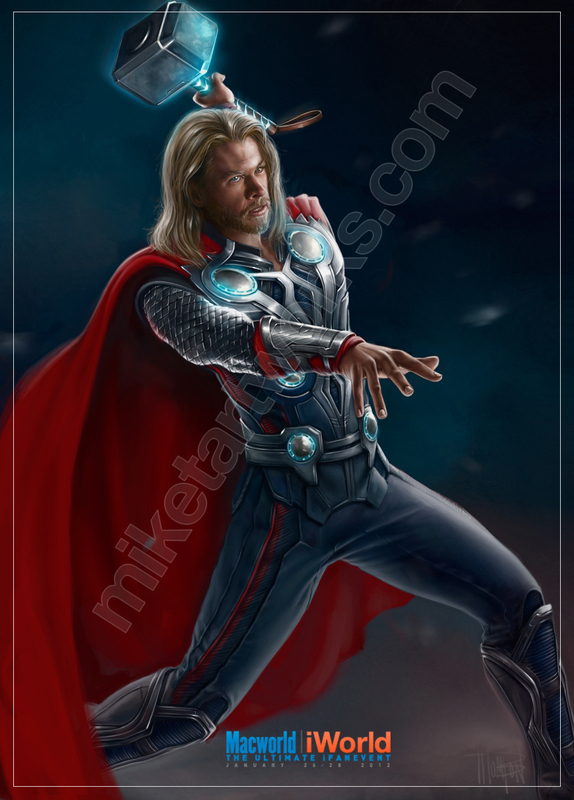 My fan painting of Marvel’s iconic character Thor will be on display along with selected other digital works of art at the show in San Francisco January 26-28, 2012. Being a die hard Apple fan and 20+ year user, and a life time Marvel fan, I am especially glad to be part of this event and have this piece chosen! If you are in the area and happen to see it please send me a photo. To all the folks who are patiently waiting to see new posts each week, thanks for hanging in there! I seem to be jammed with new work each week which seriously cuts into my tweets and these posts. I’m not complaining, it’s been a fantastic blur of a year. Still waiting for more Joes, but I’m more than busy in the mean time. 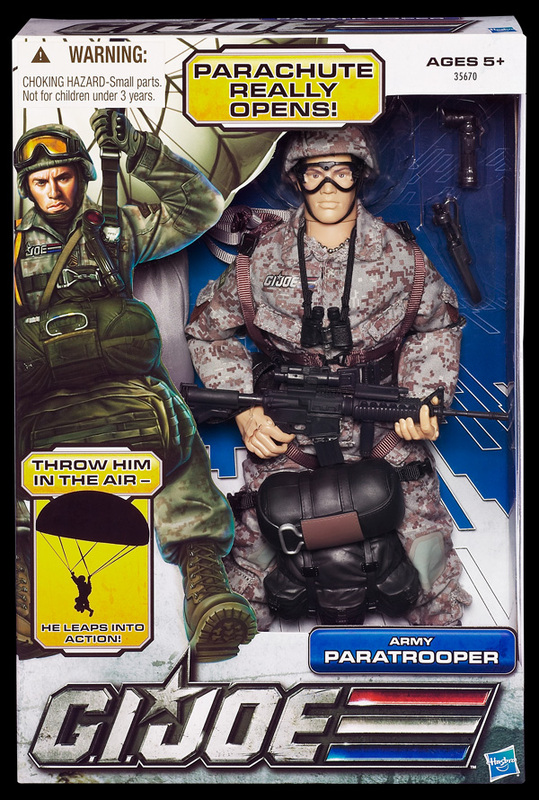 The piece I’m posting this week is my most recent work for Hasbro, the 12″ Paratrooper box art. I got the call to work on this guy early this year, and I couldn’t be happier. 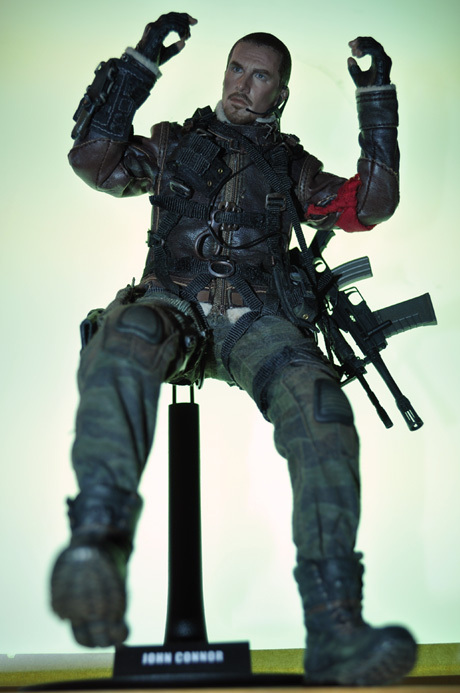 It had been nearly two years since I worked on the Rise / Pursuit of Cobra figures. After the extended break I was more than ready to jump back into the Hasbro business. I decided to take a little different approach to my pose reference for this guy. Toward the end of my run on the Pursuit figure art I got wise and picked up a John Conner large scale figure from the company Hot Toys. If you aren’t familiar with Hot Toys, they make the best 12″ license figures in the industry (In my opinion). After posing him, I broke out the old light box to add some interesting back light options then took a number of photos. As you can see this guy already looks awesome, which only makes my job easier! 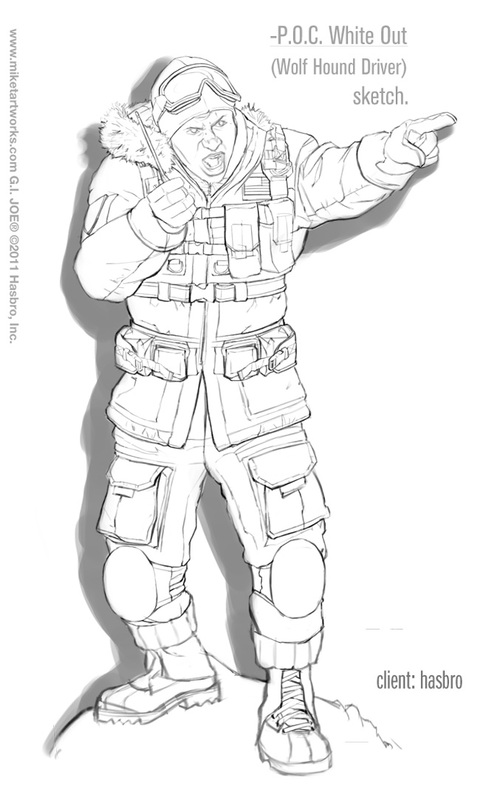 Once the pose and lighting were nailed down, I needed reference for the parachute rigging. I went online and found some great military images. 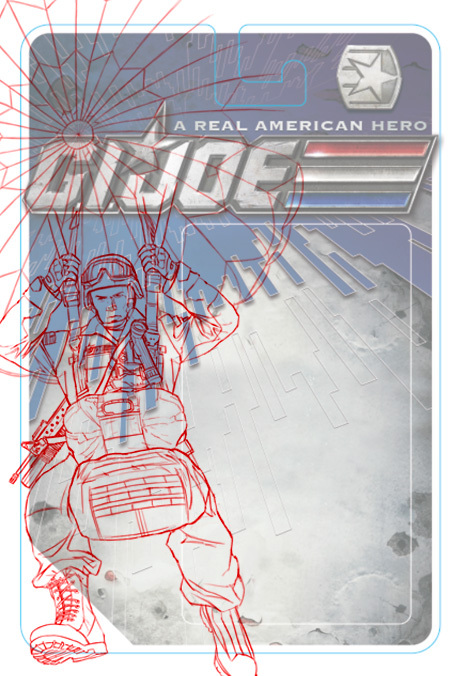 This piece posed an interesting challenge, in that I had to fit the guy and the open chute on the box. Normally you would need almost a bottom view to see everything. I had to take a few liberties and create a forced perspective to make sure everything fit. After submitting a couple of rough sketch options to the client, I got an approval and quickly moved on to my line drawing. Having great photo ref saved me some serious drawing time! I wish I had the John Conner figure for my other paintings. I used Corel Painter 11 for my line drawing, to save time. Not to mention, “Who really enjoys scanning and cleaning pencil drawings? !” I have to cut corners whenever possible to make my deadlines, so I bypass the scanner when possible. 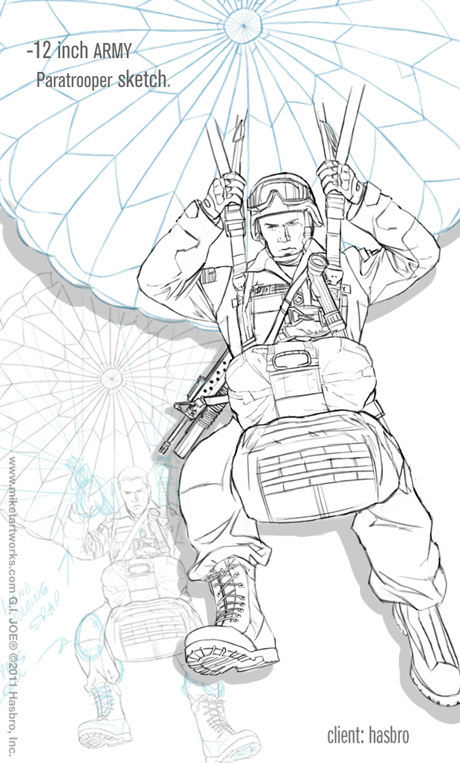 Since the placement of the paratrooper was so critical, I put the guy and open parachute on separate layers. This way they could be moved around If needed. I completed the clean line and got the exact dimensions of the box from the Art director. He provided me with a spec sheet that showed me what active area I could paint into, and what areas to avoid. When the drawing was layered on the box, I noticed it didn’t quite fit. Better to notice at the sketch stage, rather after I paint. After a little adjustment the clean line was approved without any major changes and I began painting. I decided to fill the background with a neutral sky blue-gray color. 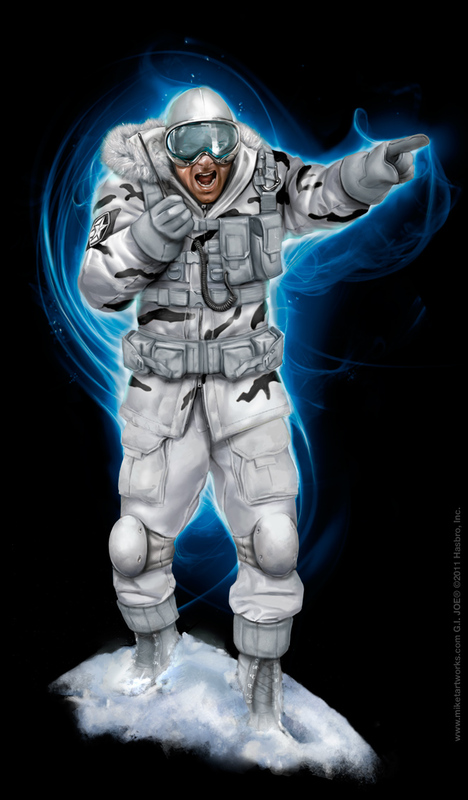 Unlike the 6″ figures I’ve done in the past, this guy would have a graphic background. Meaning I didn’t need to paint the plasma background. 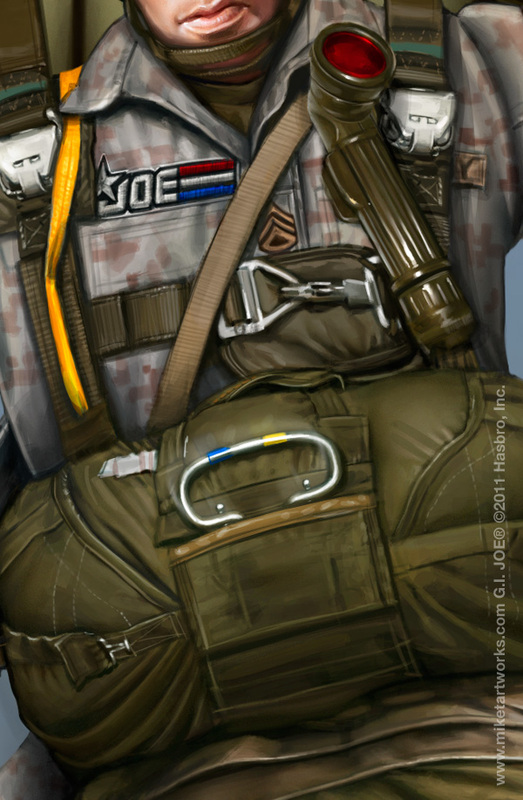 This allowed me to spend more time detailing the uniform. That was great, since this art would be reproduced at a larger physical size on the package. 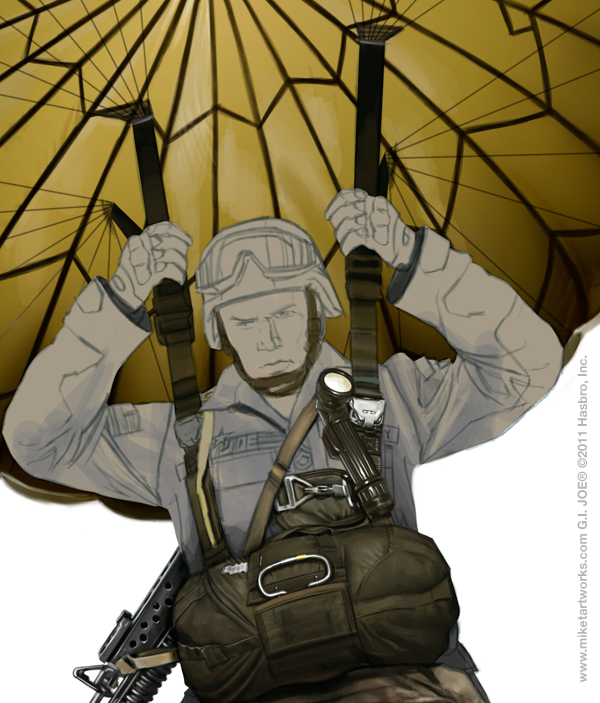 Referencing some of the photos I found earlier online, I started on the parachute. Again, the angle was totally forced in order to make the composition work. I decided to paint the entire chute on it’s own layer, in case I had to move the guy around. 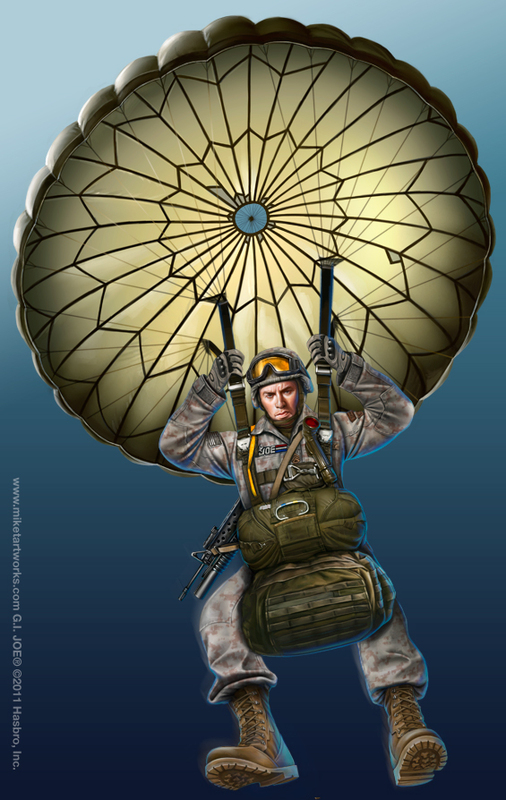 Also, YOU NEVER KNOW WHEN YOU MIGHT NEED AN OPEN PARACHUTE ILLO! …Now, I have one. Painting the parachute was easy compared to the cords. Since the angle I painted the parachute didn’t match the guy, the rigging was way off. I am probably the only person who noticed or cared, but my OCD kicked into overdrive. 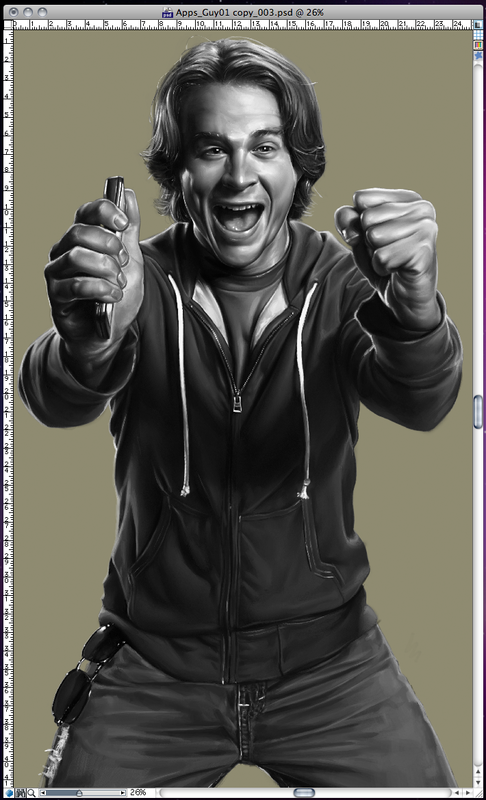 With a quickly approaching deadline, I got it together and moved on to paint the guy. The process for the paratrooper was my usual. Block in my large areas, then work the details. “Rinse and repeat.” Once he was finished, I added a cobalt blue rim light to match the graphic he would eventually be placed on. Total time spent cooking this painting was between 40-50 hours using Corel Painter 11 and Photoshop CS5. I think I had to do a couple of all-nighters to make deadline, but it worked out in the end. I would probably paint these things quicker if I didn’t obsess, but that is easier said than done. As always, click the images for a larger view. Here is how the painting looked on the retail box. If you think this tutorial was helpful, please like and share it! More to come! Oh, I need more Twitter followers, so please tell a friend. Seacrest, Out! 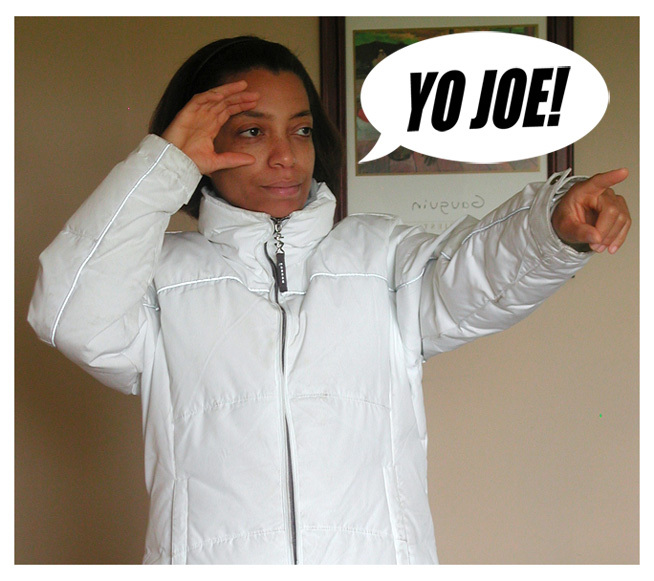 NEW JOE UPDATE 11/19/11-White Out. 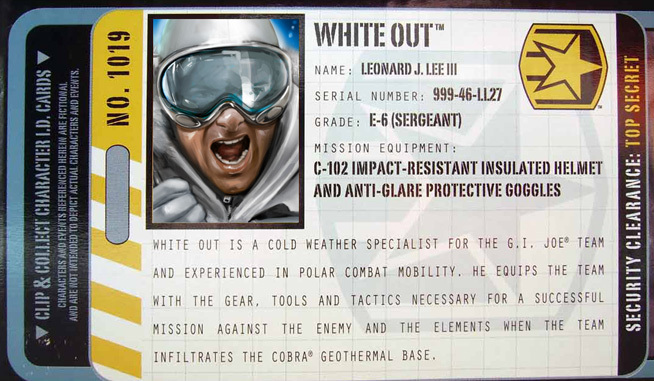 This week I have decided to show my painting for the “Pursuit of Cobra” Whiteout. Of all the figures I’ve painted in this line, he is one of the more straight forward. Basically a guy in winter gear. That fact actually made him more difficult to pull off. With no jetpacks, armor, or doomsday devices strapped to his back, he kind of just looks like a regular dude. The way I tried to get around this was to give him a dynamic pose. I knew what I wanted and asked my wife to model for the reference photos this time. Next I took a few additional shots to establish the expression and tone I needed for this illustration. 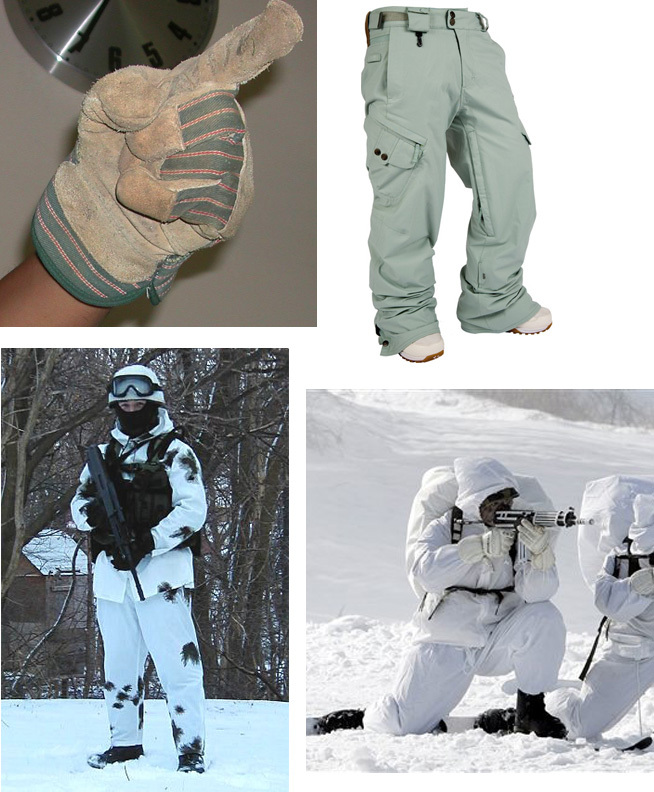 Also I dug into my photo library to get Picts of gear; belts, pockets, boots, etc. I usually spend between one to three hours looking for the perfect reference. More often than not, I have to force myself to stop searching and move on. Now that I had everything I needed it was sketch time. Same process as always, a quick rough which is refined to get a tight drawing. I can spend a few hours to few days on a clean line drawing. I know it’s more time than I should spend on something that will be completely covered in the end, but it usually saves me time when I paint. Think of it as a “Measure twice, cut once” type of approach. 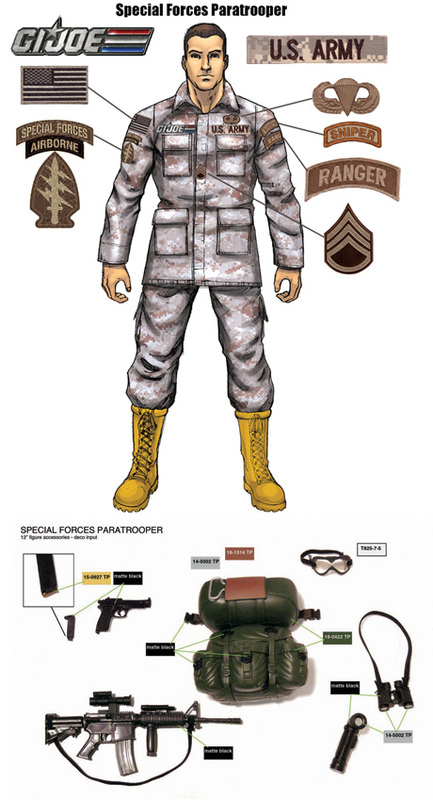 Again Hasbro sent me very good photo turn arounds of the figure as you can see below. 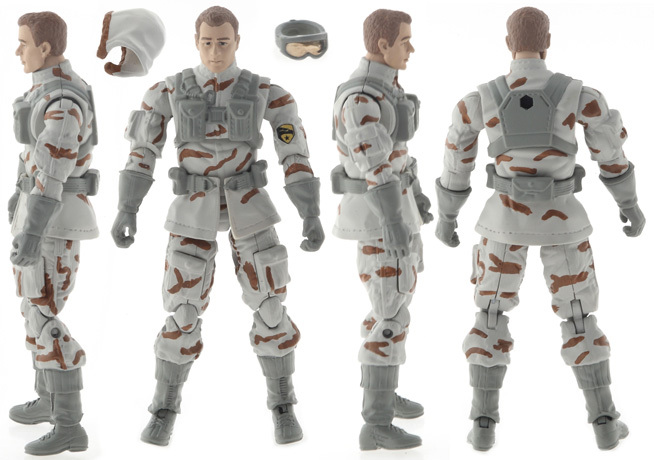 Hasbro White Out figure Ref photo. Now on the the paint! As usual, I start by blocking in my tones. 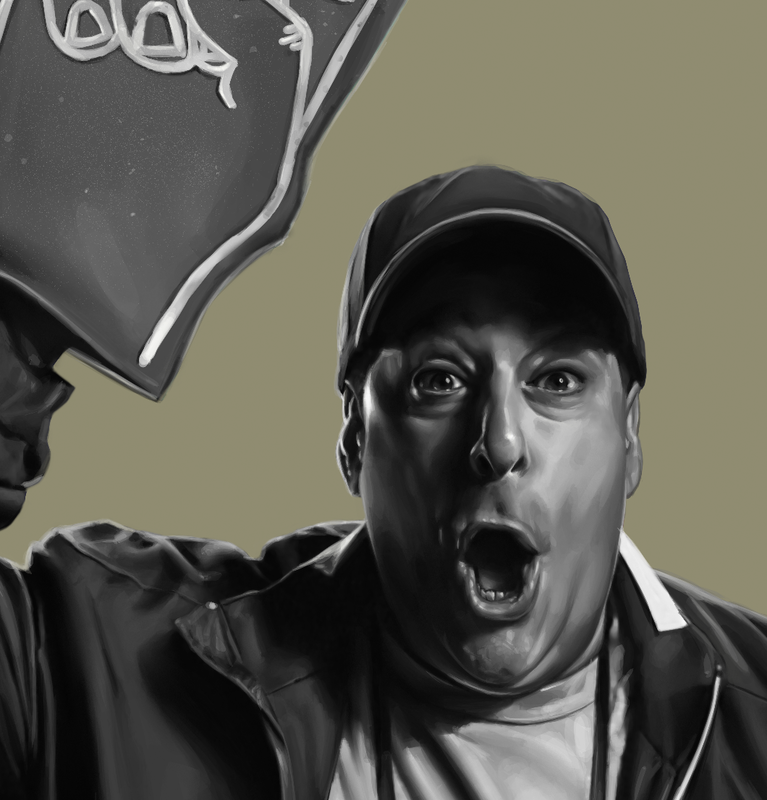 One thing to note is that I was very unsure about how to handle the face early in my painting. My early attempts at the expression just didn’t work. 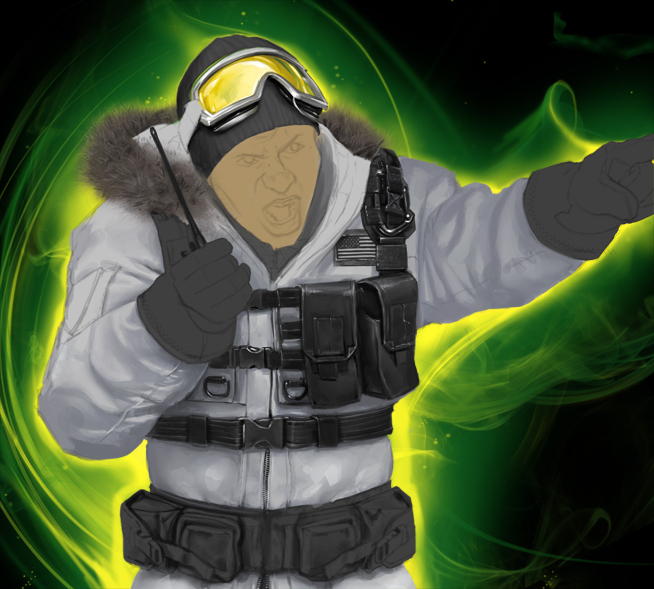 I decided after a few attempts to just paint the goggles over his eyes and save myself a ton of time and trouble. once I moved past the face, I spent most of my time rendering the gear. Since he was originally supposed to be released with the “Rise of Cobra” line, the background began as the standard green plasma. Later Hasbro made the decision to move him to the “Pursuit of Cobra” grouping so I changed it to blue. 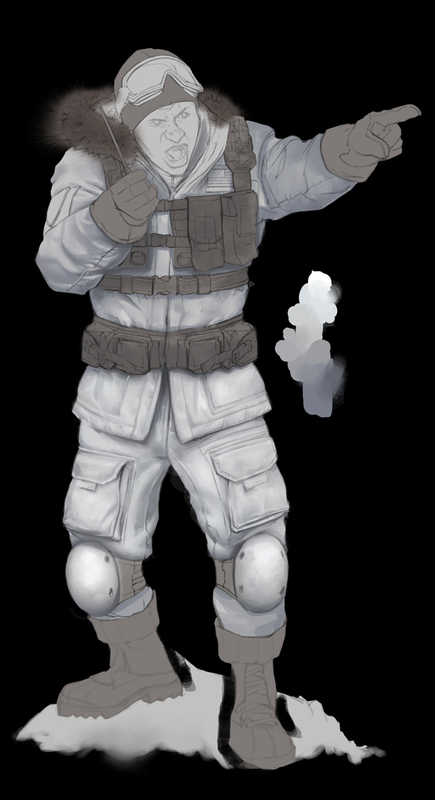 Also, I repainted the black gear to a lighter gray as not to stick out like a sore thumb in the snow. I used Corel Painter for this, and decided to use the FX fur brush for the hood as a starting point. I then did a quick paint over to make it less “filtery” and boom, quick Fur! 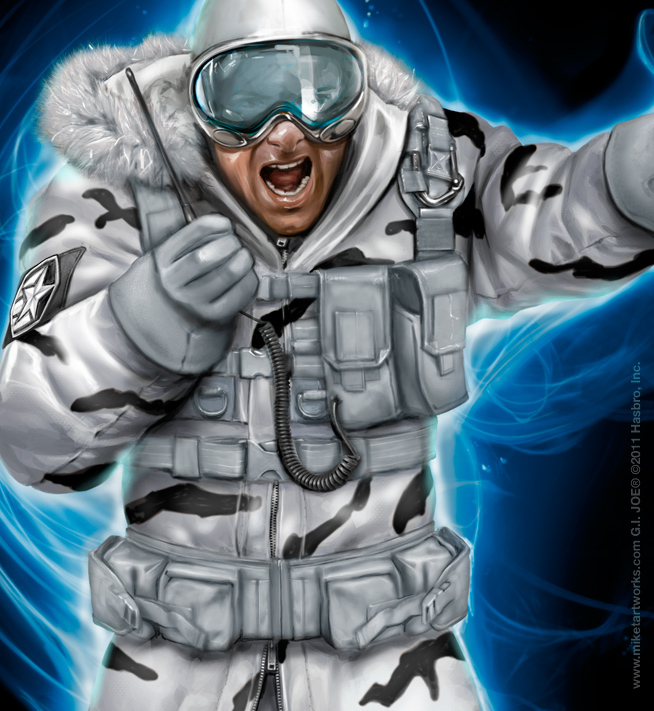 Because this guy was packaged with a vehicle the art was cropped down pretty drastically. Below is what remained on the retail box. That’s it for this week, again sorry for missing the past couple of weeks. More to come. Please feel free to comment, subscribe and join me on Twitter for more updates!